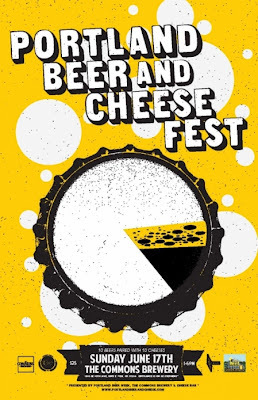 Two of the worlds greatest foods come together in the first ever Portland Beer and Cheese Fest as part of the 2nd annual Portland Beer Week. We believe beer offers a superior pairing over wine, is more versatile and provides a bold range of flavors that make it the ideal beverage to pair with cheeses from around the world. Just ask Portland Beer and Cheese Fest co-organizer Steve Jones, current reigning world champion Cheesemonger and owner of the acclaimed Cheese Bar, "Beer is a grain-based beverage; dairy animals have a grainbased diet. The terroir is undeniable. Hands down beer is a better pairing medium then wine." Rather than simply offer a cheese station at a beer festival, organizer Ezra Johnson-Greenough, also of Portland Beer Week, wanted to challenge peoples perceptions and guide them into pairing choices. Ten different breweries were chosen to highlight one beer and organizers will choose a specific cheese to pair with it. When brainstorming the perfect location for their beer and cheese fest Steve suggested a small up and coming brewery, The Commons as a possible host. It turns out they had found the perfect 3rd partner in owner Mike Wright who blossomed his home brewing hobby to a nano brewery called Beetje operated out of his garage to a full blown urban farmhouse style brewery with 2 employees now known as The Commons. The Commons Brewery resides in the Roofer's Supply building in inner SE Portland and offers a refined but rustic ambiance. Steve’s long background in cheese has been driven by his passion to support small producers by sourcing and sharing exceptional artisan products. His cheese adventures include directing the cheese department for Provvista Specialty Foods Inc., one of the nation’s most admired wholesale purveyors of fine cheeses and specialty products; brokering for a group of Oregon artisan cheesemakers; and interning in affinage and marketing with Neal’s Yard Dairy in London. Steve has been active with many local and national cheese organizations. He is a founding member of The Wedge, the biannual Portland cheese festival, and in 2009 was half of the winning team in the American Cheese Society's (ACS) first annual Cheese Mongering competition. Steve has served as a judge for the ACS annual competitions and has volunteered as a panel member and presenter for ACS and other organizations on numerous occasions. In 2011, Steve competed with 40 cheesemongers from around the world to win the 2nd Annual Cheesemonger Invitational in Long Island, New York. Steve has appeared in local and national media outlets, including Portland’s Live Wire radio show and National Public Radio’s The Splendid Table. A small craft brewery located in Southeast Portland, Oregon. We are inspired by European brewing tradition and Northwest grown ingredients. We take a very hands-on approach to brewing our small batch beers. The Commons was born as Beetje Brewery in the garage of Mike Wright on a 1 barrel nano system. It did not take long before Mike was dreaming of expanding the operation and upgrading to a true commercial system. That dream was realized with a new space and a new 7bbl system. You can find our beers in and around Portland, Oregon and in the tasting room on weekends. Founded in 2011 as a celebration of the world's greatest beer city and the most advanced beer culture on earth, Portland Beer Week is dedicated to expanding peoples perception of craft beer. More than a series of festivals organizers hope to teach as well as learn about the many facets of craft beer, from seminars to beer festivals, brewers dinners and blind tastings. This is new, it's different, it's Portland Beer Week.